Pip’s opened in 1935 on Strongs Avenue in Rutland right below the old Quebec City Cigar Company. Barbers joined the union, took vacations at the same time, and enjoyed the healthy economy together. The area was bustling with people courtesy of a 24-hour-diner next door and the nearby fire department. Pip’s was a staple to the community as a place to grab a haircut. Pip ran the shop for for 24 years straight with his first two barbers, Jim Coarse and Joe Chaffee, until World War 2 began. He enlisted and he left the shop in the care of Jim and Joe while he served his country for six years. A photo of Pip Muscatello, courtesy of Pip’s Facebook Page. Pip returned home in 1945 and continued to establish his business, serving a loyal customer base and community. Pip had a lasting impression on his two sons, Marty and Jo-Jo, who followed in his footsteps in the barber industry and military service. Jo-Jo served in the Korean war, and Marty in Vietnam, while they both eventually made their way back to the barber shop they called home in Downtown Rutland. Marty Muscatello remembers helping out around the shop throughout his childhood. He describes the shop as an whole family affair — his father and two uncles owned the building together. Downstairs there was a little store in the first window where Pip’s brother Jimmy was an accountant, next door was Modern Cleaners, which was owned and operated by Pip’s brother Charlie, and, of course, Pip’s. Marty and his wife, Jo, bought the building from the Muscatello Brothers to preserve the shop the shop’s old school looks, carry on the family legacy and maintain the owl painting on the side of the building during its remodel. That old-school atmosphere fit the bill for a scene from the movie “American Gun” — starring James Colburn — which was consequently filmed there in December 2000 for a classic barber shop scene. Marty Muscatello and his niece, Jessica Reynolds, stand in front of Pip’s. 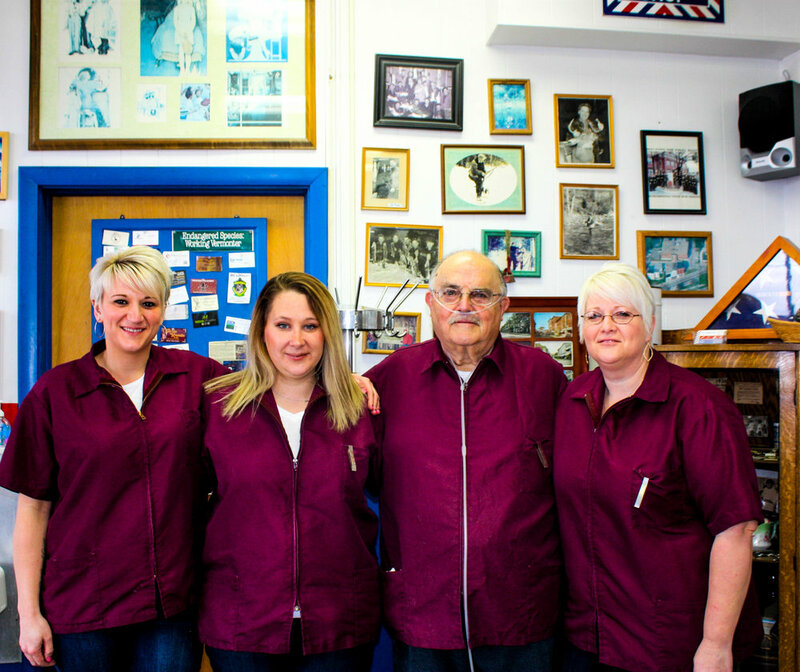 After working at Pip’s for 51 years, Marty still cuts hair on Tuesdays alongside three other barbers you can find in the shop during operating hours — Alex Harrison, Sarah Sheldrick, and Marty’s niece, Jessica Reynolds. The Muscatellos built a community where loyal customers come back time and time again; not just for the excellent cut but for the service provided by the family owned and operated business. “Pip’s stands out; its been here since 1935, and it’s iconic. Because of the quality of the haircuts, and because it’s a family business, its stayed through thick and thin in downtown - even through the lean times. We’ve been here from the beginning,” Muscatello said. Jessica Reynolds got to experience growing up around the shop, where Pip told her she’d one day become part of the family business. While a female barber was hard to find in Pip’s heyday, the industry began to change in 1985 as at least 50% of new barber students were female working towards a career in the profession, according to the National Barber Museum. Barbers Alex Harrison, Sarah Sheldrick, and Jessica Reynolds stand with Marty Muscatello in Pip’s. Today it’s a norm for females to work in the industry. Reynolds cuts hair alongside her Uncle Marty to this day, as she has in the family shop since 1995. Marty and his wife Jo have hopes to continue to pass the family business down to future generations, but for now they look to keep up with current trends and are happy to have a great community and clientele that supports them. If you’re thinking about becoming part of the Pip’s family, stop by the shop at 7 Strongs Avenue in Rutland and get a specialty cut. While you’re there, check out the original white owl mural that markets the brand on side of the building and take in the atmosphere of plants, pictures, and keepsakes that decorate and commemorate the business. Pip’s is open Tuesday through Friday from 8am to 5:30pm, and Saturday’s from 7:30am to 12pm. For more information and to keep up with the Mucatellos, visit their Facebook page.